~During the late 1980’s and all of the 90’s, Barb and Brad (B&B), and Fran and Grant (F&G) were close neighbors of mine (and my ex) when we all resided on Manor Lane in Yardley, PA. After the devastating floods in 1996, F&G were the first to move out in 1997. B&B followed in 2000, and I finally left for drier pastures (with Russ) in 2011. But friends we remained. And so every Christmas season the three couples get together for some holiday cheer, and this year it happened to be at our place, Casa H.
We dined on Russ’s famous Braised Pork N ‘Kraut, the always tasty and versatile, “go-with-everything” Celery Root Puree, and homemade Solebury Farm Apple Sauce, and a festive side salad for starters. 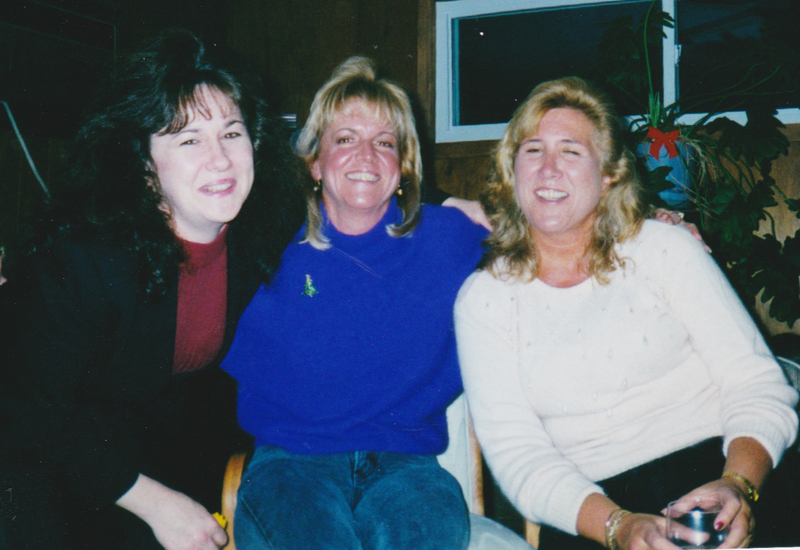 Fran, Lynn and Barb in the 1990’s on Manor Lane North.